LATE LAST WEEK some 15 students showed up at my office and asked if they could have a few minutes with me. Now, for a university president, this could signal any number of things, many of them not so good. Perhaps they have a concern about some perceived deficiency in our programs; maybe they want to register a complaint about food, or too many triple rooms; or perhaps they will protest our investment policies or our use of a certain kind of coffee. But no, these students said they wanted to pray for me. Can you believe that? They had all participated in SPRINT, a powerful, solid program — much of it student-led — that sends students into the tough spots of the world to serve. Through this experience, and so many others in their university careers, they had begun to grasp a big vision for their lives. As these students prayed, I was deeply touched. They would say things like, “Lord, help us to understand better how we can change the world, how we can be instruments of your love and grace and peace in a desperate and needy world.” And I thought, these students are not here just to fulfill their career aspirations, important as those are. No, they have caught a vision that they can make a real difference, and they are asking for the tools, for the shaping of their gifts and talents, for the channeling of their energies, to be change-agents to make the world a better place. I have been reflecting a great deal on character lately. James Davison Hunter, in his book The Death of Character, says we have lost the ability to teach character in our society, in large part because we have no moral agreement in our culture. If we have no agreement on right and wrong, on what integrity or honesty means, then indeed, character is hard to come by in our culture. But the challenge of teaching character only reinforces the need. We must be about the business of character formation. Hunter goes on to say something very interesting: “Implicit in the word ‘character’ is a story. It is a story about living for a purpose that is greater than the self.” I think that’s exactly why Seattle Pacific University is able to teach students character. We have a big story that frames all of our work. I have said it many times before: The really big story is that God wants all of his children to flourish. His heart grieves when his children are not flourishing. And he offers us an opportunity to participate in that flourishing and to bring that flourishing into the world. That�s the big story we strive so diligently to give to our students. This fall, we open the public phase of The Campaign for Seattle Pacific University, the largest fund-raising effort in the history of SPU. Our carefully designed goal for the Campaign is $52.85 million. As we go public, I am grateful to all who have already helped us cross the $31 million mark. This is a strong beginning, but in an uncertain fund-raising environment, we have to roll up our sleeves in the weeks and years ahead. We need all of our friends to lock arms with us. The key to the Campaign is that we all understand we are investing in a purpose bigger than ourselves. We are building new buildings and want to build some more. We are investing in quality programs and have great plans for others. And even though our endowment has grown dramatically over the last 20 years, we are taking on the huge challenge of building an endowment adequate to our vision. We have a very careful plan to shape a premier Christian university. We have been working for some six years to sharpen this plan for excellence. But we have to keep asking, excellence for what purpose? Why do we seek to be a premier Christian university? Precisely so that we can better understand our contribution to the really big story of God�s plan of love and grace and light and flourishing for all of his children. To live out the gospel of Jesus Christ is such an exciting venture. The world is a frightening place, and I worry at times for our students that they will be overwhelmed by its complexity, its darkness, its pain and suffering. But the gospel shines light into this world. In this light we are given the great gift of hope, and we are given the opportunity to be change-agents. This is what The Campaign for Seattle Pacific University is all about, and this is what you will encounter in this issue of Response. As you and I invest in the Campaign, we are really investing in a venture of change and hope. What an extraordinary opportunity. Titled �Engaging Faith: SPU President Philip Eaton Champions the Radical Middle,� this eight-page feature story talks about Eaton�s work ethic and responsibilities as president; his vision of SPU �engaging the culture and changing the world�; and how he has led SPU into the public square through his writings, interaction with community leaders and support of community outreach. To view the entire article, go to www.spu.edu/president. President Eaton addressed SPU faculty, staff and student leaders prior to the opening of school this fall. His theme for the morning centered on a strategy for increasing Seattle Pacific�s profile as a premier, national Christian university. For the complete text, go to www.spu.edu/president. For a full hour, President Eaton and radio personality Dave Ross conversed on a variety of issues relating to character education � including academic freedom, moral behavior, moral judgment, individual and community rights, civility and more. 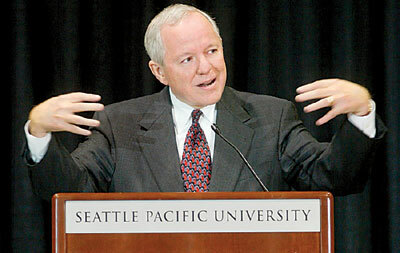 To listen to the interview, go to www.spu.edu/president. Under the title, �Let�s Not Declare Character Dead Just Yet,� President Eaton wrote about the role of character in the health of organizations and in the health of society as a whole. For the complete text of the editorial, go to www.spu.edu/president. At the invitation of the organizing committee, President Eaton offered the invocation at this event sponsored by the Washington Policy Center, a research organization that explores public policy issues in Washington state. Keynote speaker Rudolph Giuliani, former mayor of New York City, addressed the crowd of more than 1,000 people. President Eaton addressed 250 Yakima Rotarians on the subject of character and leadership. President Eaton was the inaugural speaker for a new Leadership Series instituted by the Bellevue Chamber of Commerce. His remarks focused on character, leadership and ethical decision-making in education and other arenas.